Dizziness is a term, which is difficult to define, and is often mistakenly used to describe feelings as imbalance, nausea, hypotension, weakness, double vision, blurred vision or discomfort. Dizziness presents itself as a false sense of proper motion or the environment and is often associated with imbalance and / or nausea. When dizziness is caused by a sense of rotational motion, i.e., it seems that everything is turning around, we call it vertigo. Vertigo is the most common type of dizziness. Why do dizziness and vertigo come? To keep us in balance, to know what position we are in relation to the environment (lying, standing, leaning, legs straight, raised arms etc.) and whether we're standing or moving, we need to provide detailed information to the brain about our bodies. Within the inner ear we have an organ called the labyrinth that is part of the vestibular system responsible for maintaining balance. The labyrinth is a series of semicircular arches that hold liquids inside. The movement of these fluids is interpreted by the brain helping to identify movements and keep us in balance. Information passed through the maze by moving these liquids helps the brain to interpret angular movements, linear accelerations and gravitational forces. Just for curiosity, do you know why we goon after we run several times? Because when we stop running, despite already being stopped, the fluid within the inner ear are still in rotational movement for a few seconds, causing the brain to interpret that we are still running. If we close our eyes, dizziness increases further, because your eyes open vision can mitigate the wrong message that's sending the inner ear to the brain. The characterization of a dizziness as vertigo is important because this is a typical symptom of diseases of the vestibular apparatus. The most common causes of vertigo are the diseases that affect the inner ear asymmetrically, either calcified areas of the maze by inflammation, by infections, trauma or excess fluid in the vestibular apparatus. As cited in the introduction to this text, vertigo is a type of dizziness where there is illusion of rotatory movements. This information is essential to distinguish it from other types of dizziness. Also characteristic is the fact of vertigo dizziness being intermittent, i.e., back and forth over the weeks. A permanent dizziness that never improves, is hardly vertigo. The vertigo usually worsens with head movements, which is a simple way to identify the type of dizziness that the patient presents. An important sign of dizziness is the presence of nystagmus: involuntary, rapid eye movements and short, usually toward the side. About 40% of cases of dizziness are due to diseases of the vestibular apparatus, 10% is due to brain injuries, 15% - psychiatric, 25% are not truly dizziness, but pre-syncope and imbalances, and 10% are of undetermined origin. Let us mention briefly some common causes of dizziness and vertigo. Later we will write a text about each of these individual causes. Benign paroxysmal positional vertigo (BPPV). Benign paroxysmal positional vertigo, also called positional vertigo or postural vertigo is the most common cause of vertigo, is caused by calcification in small channels within the vestibular system. Positional vertigo presents short duration (seconds to minutes) and is often triggered by certain head movements. The disease may be present for several weeks. b. Meniere's disease Meniere's disease is caused by excess fluid in the labyrinth, causing vertigo, hearing loss and tinnitus. 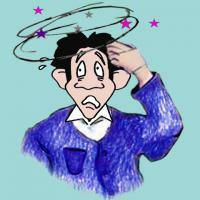 The attacks of dizziness of Meniere's disease last from several minutes to hours. Labyrinthitis (vestibular neuritis). Labyrinthitis is caused by an inflammation of the labyrinth or vestibular branch of the auditory nerve that carries the information of the inner ear to the brain. The main cause of inflammation appears to be a viral infection. Patients with labyrinthitis have a sudden onset of strong vertigo, associated with nausea, vomiting and difficulty in staying upright. There may also be loss of hearing and tinnitus. Symptoms of labyrinthitis may last several days. Vertigo migraine. Patients with migraine may also have episodes of vertigo. 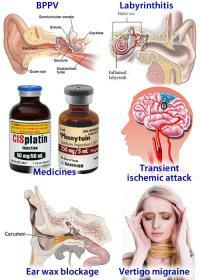 Stroke or transient ischemic attack. Cerebral ischemia or infarction may cause dizziness. The picture is more common in the elderly, in patients with a history of diabetes, hypertension, smoking and cardiovascular disease. Stroke often presents other symptoms besides dizziness, such as loss of movement and / or tenderness in one or more limbs, disorientation, difficulty speaking, etc. Medicines. Intoxication drugs may cause some injury to the inner ear, including cisplatin, phenytoin and the class of aminoglycoside antibiotics. Ear wax blockage. Rarely, patients with impaction of earwax may complain of dizziness. Most cases of vertigo are self-limited and although the symptoms are quite uncomfortable, they do not bring risks. The ENT specialist evaluates dizziness. However, the dizziness is accompanied by some other symptoms that can be more severe.